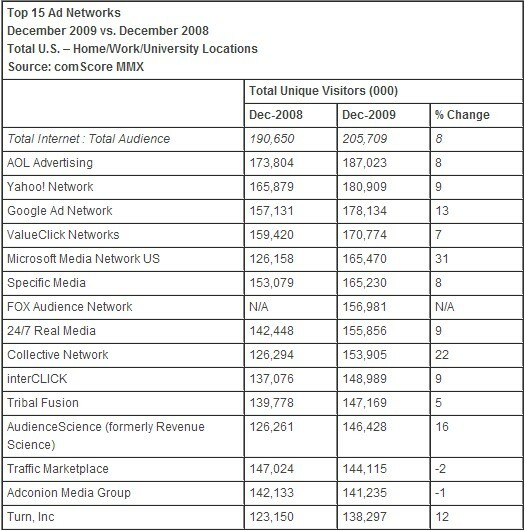 According to data released by comScore, AOL Advertising was the top ad network in the USA in December 2009. ComScore’s reasearch results show that AOL Advertising had access to 187 million U.S. Internet users. 187 million users are the equivalent of 91% of the total U.S. Internet audience. AOL’s reach reportedly grew by 8% compared to the same month in 2008. Yahoo! Network, which reaches 180.9 million U.S. users, was ranked second place and grew by 9% in the same period. The Google Ad Network occupied the third place with a reach of 178.1 million U.S. Internet users, and grew by 13% in that period. Microsoft Media Network has turned out to be the fastest growing ad network, with a growth of 31% compared to the same month one year ago. Collective Network, which grew by 22%, was the second fastest grower and Audience Science, which grew by 16%, was placed third in that category. According to comScore senior Vice President, Jeff Hackett, “Ad networks continue to be a powerful mechanism for delivering a large audience online with eight different networks reaching 75% of the entire U.S. online population.” Hackett believes that in 2010 ad-networks will continue to innovate and perform well.